I first encountered author Martin Roy Hill when I came across his seminal alternate history short story, Hitler is Coming. I found it to be a fantastic piece of counter-factual fiction, with an imaginative plot and engaging characters; and as a result, I decided to find more of his work. Signing up to his newsletter – as I do with so many authors – yielded several short stories, and one in particular stood out to me. 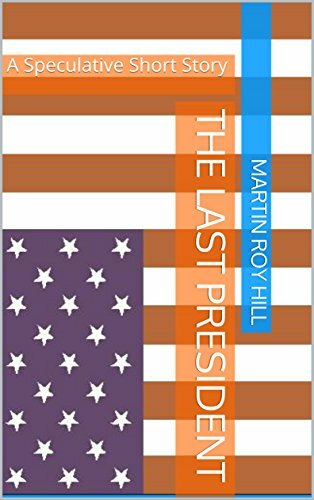 That was the story titled The Last President, and it stood out particularly due to the eye-catching nature of the cover art – an inverted American flag (the traditional symbol for distress). It was certainly provocative and symbolic of something, particularly as it was subtitled as speculative fiction, so I dived right in and got reading. Hill quickly and vividly paints a picture of a United States of America that has come under the thrall of corporate ownership – company-rented houses, corporate-owned police, the banning of seditious music from their radio stations; these are all subtle but distinctly unsettling signs that all is not well in this near-future setting. It’s an interesting and engaging scenario, particularly since this, worryingly, seems to be a direction that the United States, and to only a slightly lesser extent the rest of the world, are inexorably heading towards. Our protagonist, Frank Wengler, is a Sergeant in LawPro, the latest in a string of companies that has won the bid to manage his privatised police department, and which once upon a time used to be government-run. Hill provides some nice depth to this element Wengler’s characterisation, highlighting how the corporate focus on the bottom line leads to a slow but sure degradation of quality, until Wengler’s fellow privatised cops are graduating through an online course without any practical experience. Wengler is called out to a disturbance, where a former corporate worker has been evicted but refuses to leave. Mysteriously, the former employee’s name has been redacted from the eviction notice, and as Wengler proceeds with the eviction, he gets drawn into a tangled web of corporate power-grabs, political machinations, and the truth behind the stranger’s identity. Despite the short length of the story, and the natural limitations of the format, Hill once again replicates the attention to detail and imaginative narrative that I found in Hitler is Coming. As the story progresses, we get little glimpses of how this near-future corporate dystopia evolved, and each mention is done so deftly that it’s like a literal hook for the readers attention, especially as so much is teasingly left unexplained. Social upheaval, a Corporate Congress ruling the country, a bloody and protracted war in South America in the naked pursuit of corporate interests – they all add up to a first-class and deeply engaging piece of speculative fiction. By far the best part of the story is the titular Last President. Hill really goes all out to create a character we can empathise with despite the fact that we know what happened, and what the Last President allowed to happen to the country; or at least was too arrogant to recognise and stop – if it could have been stopped at all by his time in office. Hill highlights the dire price paid by this lonely old man, and it’s difficult not to feel bad for him despite his pivotal role in creating this dystopia. There’s much more detail to be found within the pages of The Last President, but I’m not going to spoil them here. Suffice to say that it’s a very well written but incredibly grim story, and Hill is too clever to leave the reader with anything other than ambiguity; indeed, the setting that he’s developed by the end of the story doesn’t allow for anything else. The Last President is an excellent piece of speculative fiction yet simultaneously also a warning – a glimpse of a disturbing yet worryingly realistic future that may come about if we aren’t incredibly careful.